No More Mystery. Let’s Talk Tannin: 5 Things You Must Know. this Cote de Tablas you can buy from our PASO EPISODE has tannin! You may have gone tannin’ in Mexico, but we’re here today to talk about a different type of tannin: the kind found in wine! Tannin is one of the more mysterious elements of wine because it can’t actually be measured: only perceived. And because of this, there’s a lot of confusion as to what it is or tastes like, and when it’s good and when it’s bad: but buckle in, because we’re gonna fix that. Start with the VIDEO ABOVE ↑ and then, let’s dive deeper. And if these terms sound like gibberish (acid, tannin, body, etc) then make sure to SIGN UP to get the FREE wine pairing guide and more wine content broken down simple right to your inbox. Tannin is usually described as a bitterness or astringency, which is why some people have trouble with it at first. Just like the first time you drank black coffee, it can be jarring if you’re not used to the flavor. But more importantly, it gives wine a texture, firmness, or structure: it makes it bold, powerful, with a “slap ya in the face” backbone. This backbone dries the mouth out, especially the gums. Now, if you’re the type of person who likes grammar and semantics, keep reading. Otherwise, jump to #2. Ok, here we go. Because tannic wines dry out your mouth, some people describe tannic wines as “dry”, which isn’t quite accurate. While most tannic wines are dry, this has nothing to do with tannin and everything to do with the lack of sugar in the wine. Dryness and tannin are unrelated. To prove it, we could say that a tannic wine isn’t necessarily dry: Port wine is sweet (the opposite of dry) and tannic. Or to put another way, Pinot Noir is dry wine with low tannin. Tannin and dryness are unrelated. Got it? Step aside Chardonnay. Tannin is a chemical element found in the stem, skins and seeds of the grapes (this combo is called the “must”). Because of this, it is only noticeable in red wine (and orange wine, for the sticklers out there) because red wines are the only wines where the juice sits with the must. In white wine, the juice is simply pressed. The longer a red wine sits with the must, the more tannin in the final wine. More importantly, the thicker the skins the more tannin the wine has, because most of the tannin comes from the skins. This is why wines are often classified into thin skin grapes (Pinot Noir, Sangiovese) and thick skin grapes (Cabernet and Syrah). 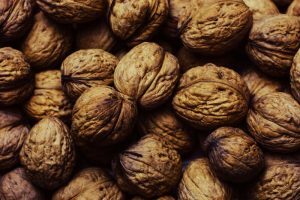 walnuts have tannin too ya’ nut! 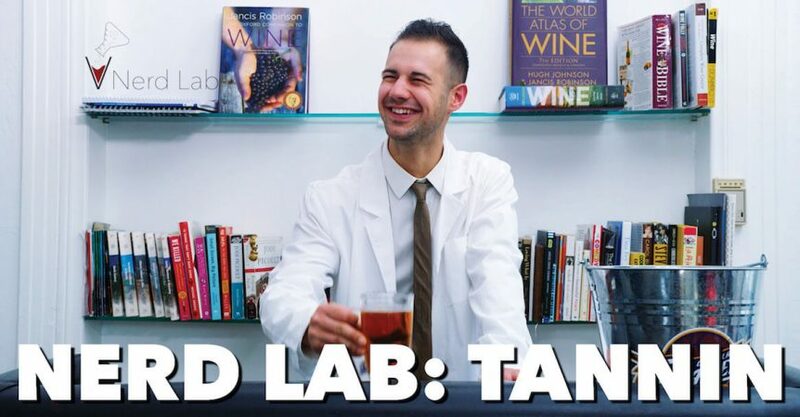 Black tea is the most tannic element from the above list, and if you haven’t yet, WATCH OUR NERD LAB on tannin to see our tea experiment. 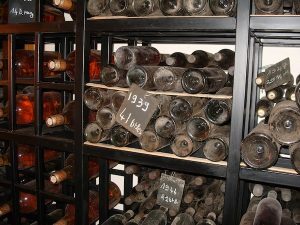 the best wines are older than you! 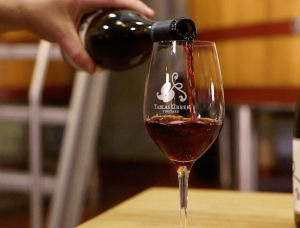 Tannin is one of the main components that allows red wine to age. It acts as a natural preservative to the wine. But it does more than that: as high tannin wines age, the tannins that were bitter and harsh in their “teen-angst” years are suddenly mellow and refined in their golden years. What are some high tannin wines that tend to age well? So how is this all relevant to you and your next bottle of wine? So you can pair properly of course! Tannin pairs well with fatty foods. 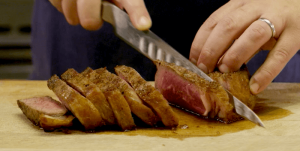 The proteins in the fat bond with the tannin and soften both: it’s why fatty steaks melt in your mouth when paired with a tannic wine like Cabernet or Barolo. It’s why people add fatty cream or half and half to tannic earl grey tea. And if you find yourself with a tannic wine and want to soften it quickly, pair it with some cheese which has a lot of fat. One final trick with tannic wines: decant it for a few hours, which simulates aging and softens it up! V is for Vino | Watch. Learn. Drink.